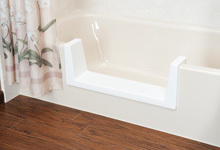 Walk in tubs from Waddle Exteriors is a great solution for those needing an easy to get in and out of bathtub. Whether it’s mainly for safety reasons, or if you just want to take a relaxing bath at the end of a stressful day, our walk in bathtubs are a great choice. With our walk in tubs, you can lay back and relax in a full soak up to the chest. It’s said that stress is the number one killer of Americans today. Our walk-in tubs are custom molded to fit directly in place of your existing tub. Our installation process takes about a day and doesn’t require major construction. Our factory trained installers can come to your home and measure your bathtub’s current space to ensure a custom fit. They can also answer any questions you may have including design advice. Our walk-in tubs are also great for the elderly or handicap. A walk in tub allows you to open a short, light weight door outward and enter the tub with about a 2 inch step in. So there won’t be any large step you’ll have to take and risk falling or getting hurt. For a trustworthy quote on our walk-in tubs call Waddle Exteriors or request a quote online and get on your way to having a beautiful new walk in tub.